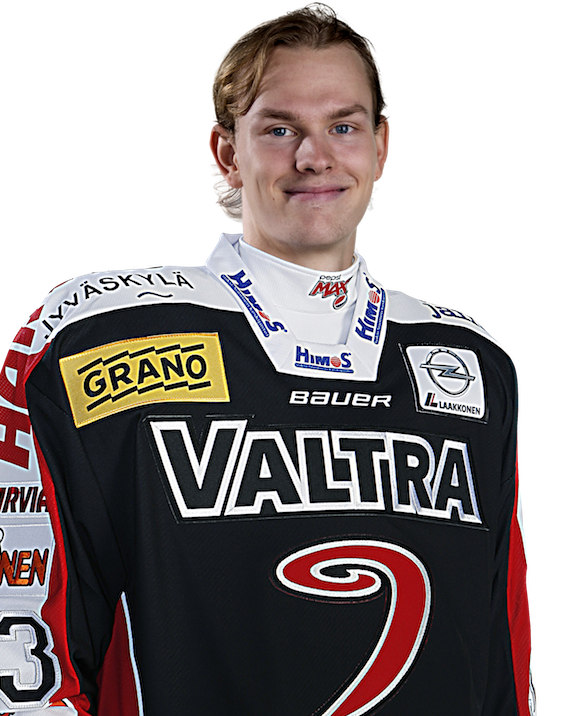 The Boston Bruins prospect was paired with fellow first round selection Juuso Välimäki and they played well together. Vaakanainen gets around the ice effortlessly showing fluid strides, great four-way mobility and edge work. He controls pucks well at the offensive blueline and has a rather strong shot from the point. In the 2-1 goal, he unleashed a quick wrister from the left side and Eetu Tuulola buried rebound home. He also made good decisions in possession. However, the skilled blueliner seemed to occasionally struggle defensively today. Vaakanainen plays a fairly safe game offensively, hence I’m interested to see if the offensive side develops to another level with more responsibility in the new Liiga season. Defenceman got an assist against Canada when Kristian Vesalainen scored on rebound of shot from Vaakanainen. Canada also made a goal after Vaakanainen lost puck on defensive zone while Finland was playing short-handed game. Vaakanainen has played pro game with little offensive responsibility this season. During the U18 World Championships Vaakanainen has tried to create more offense but when he has been carrying the puck, his decisions occasionally take too long time. But otherwise you can see how big advantage games against men has been. Defenceman constantly won one-on-ones and board battles, checked effectively with his stick and his gap control and positioning were top notch. Also his passing play was reliable. I was also positively surprised about his skating. He hasn’t been below average skater in Liiga either but his skating and top speed were excellent compared to other players of his age. And because his hockey IQ is extremely high and he almost always does the right solution, I think he will have bright future ahead in NHL as more defensive two-way defenceman. Vaakanainen seemed to have some problems adjusting to smaller rink. He occasionally seemed slow to react and made surprisingly hasty passes which is uncharacteristic for him. Defender had also some problems keeping up with the pace of Czech forwards. He wasn’t able to get his offensive game going due to these problems even though he has good hockey sense. However Vaakanainen was able to play solid game at the own end. His positioning and physical game were impressive for the player of his age, even though he could show even more grit. After the first game of the tournament, it looks like he is most useful as defensive defenseman, but he might be able to step up with his offensive game as the tournament progresses. Vaakanainen’s fall has been affected with health problems, but he has now played four straight games after his return from the injury. He hasn’t yet recorded a point, but his overall play is still at a high level. If you didn’t know, you wouldn’t be able to guess you’re looking at a 17-year-old playing against professionals. Vaakanainen played a very good game against Ilves. He won physical battles, positioned himself right at almost all times and started attacks effectively. His offensive game isn’t at the level it was expected to be this season, but his Corsi number is one of the highest of his team while his PDO is only 917, so the offense will probably come sooner or later.